It took 45 minutes being cuffed around the ear for West Ham to learn that just being in the Premiership is not enough. Being competitive is another story. Having been outfought, outmanoeuvred and outplayed in a chastening first half, they emerged emboldened, took Blackburn apart and proclaimed themselves top of the embryonic league. Conversely, it's August alarm bells for Blackburn. Their fans wondered whether they might see a different team this season. Having been the paltriest scorers in the division, winning no friends for artistic impression in the process, Rovers duly began the campaign with a new partnership of Craig Bellamy and Shefki Kuqi, but it was not an instant hit. While Kuqi was a handful, he caused no genuine danger, and Bellamy looked badly out of sorts. Then Paul Dickov came on and promptly got himself sent off. West Ham lined up with four debutants. That three of them were defensive reveals much about how Alan Pardew assesses the mission ahead. Like Mark Hughes last season, he realises self-preservation is based on meanness. It was immensely frustrating, therefore, to gift their opponents a soft, early goal. With 18 minutes gone, West Ham's defence switched off at a crucial moment. Nobody was alert to Morten Gamst Pedersen's corner, and Andy Todd accepted the invitation to sweep the loose ball past Roy Carroll. First goal of the game to Blackburn, first booking of the game to Robbie Savage for a late hack. The two incidents were not unrelated, but a symbol of the glaring difference between the two teams. Rovers displayed far more muscle - and the ruthlessness to use it. An example: in the middle of the pitch, with no apparent danger, Aaron Mokoena led with an arm to floor Teddy Sheringham. Paul Konchesky detected that West Ham needed scuffle too, and duly relished the opportunity to knock Savage into the advertising hoardings. The home fans cheered heartily. Slowly the home team chipped away at Blackburn's control. Sheringham and Marlon Harewood endeavoured to work an opening, but more often than not Blackburn rushed enough men back to block obvious routes to goal. Sheringham, who turns 40 next year, shoulders a big responsibility for his team's offensive play, and while he still has an eye for an opening, West Ham do look in need of more firepower. Sheringham mustered his team's first shot on target 10 minutes before half-time, but the effort was tame. Two more half-chances before the interval raised the tempo, and it was telling that Yossi Benayoun - the delicate but distinctly skilled playmaker - was gradually finding his feet. From the restart, Benayoun danced through the very heart of Blackburn, bobbing and weaving, and picking out Sheringham's angled run. The ball clipped the back of Todd's foot and fell kindly for the old stager to steer past Brad Friedel. Elated, the Hammers behind the goal found their Premiership voice. What a difference a goal makes. Suddenly West Ham's players looked a foot taller, a second faster and a damned sight tougher. No longer intimidated, they pressed and pushed Rovers back. 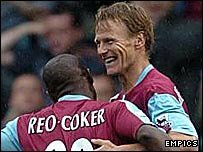 Sheringham nearly scored a second after Nigel Reo-Coker and Matthew Etherington turned themselves into giants to work another opening. Blackburn rallied and West Ham were grateful to Konchesky for clearing off the line when the pressure swung back. The home team needed to rouse themselves once more. Cometh the hour, cometh one hell of a goal. Reo-Coker's marauding run was crowned by a bullet of a strike which flew past Friedel in a blur. West Ham sealed the points through a brilliant piece of opportunism from Benayoun. The Israeli snaffled up an ill-judged back-pass and had the vision to delay his cross until he had drawn all the defenders away, enabling an unmarked Etherington to tap in. On this evidence, when they are combative, they will be a match for most on home soil. A minute later Dickov was dismissed for a two-footed lunge at Konchesky, which left the defender flat out on the turf. Maybe the Premiership is not just about being physical after all. Yossi Benayoun: Despite a toothless first half, West Ham had a number of candidates for their energetic efforts in the second. Konchesky had a solid debut, Reo-Coker scored a screamer, but what promise there was in the slight figure of Benayoun. Clever, nimble and up for it, once he settled down he created two goals. Referee: A Wiley - quiet but authoritative.